Offer period: Oct 11th to Oct 13th 2017, both days inclusive ("Offer Period"). 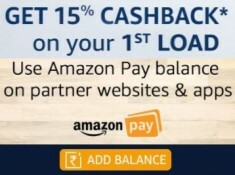 Load Rs.300 or more Amazon Pay balance to get 15% cashback as Amazon Pay balance ("Offer") in the Offer Period, on the first load only. Valid only if this is your 1st Top Up to Amazon Pay balance (Money or Gifts & Credits).